Congratulations Joana. I know a lot of people have audio books and really enjoy them. I hope they do really well. What an amazing giveaway! I don’t have audio books but I would love an ebook of The Falmouth Connection as I have the paperback only. For the moment I prefer to read books at my own pace as I often flick back to ‘re read something. Thanks Glynis! I know the feeling about flicking pages – I’m such a flicker too 🙂 But I was totally sold on audio books after a particularly memorable journey. I could have happily driven to Land’s End! All the best, thanks for the lovely wishes and have a really nice weekend! Congrats on the audio release, I’m so happy my guess was right. Thanks for this giveaway, if I should win I would prefer an ebook. Brilliant guess 🙂 Many thanks and best of luck! I am fangirling so hard over here! Love love love Joana’s books, and I’m over the moon to see such a dynamic duo teaming up to make theses gorgeous audiobooks. Fangirling right back, Nicole!! Love your takes on P&P and N&S. ‘Rumours’ was such fun and ‘The courtship’ sooo sweet! IMO your Margaret & John are even better than the originals and he’s totally swoon-worthy. Can’t wait for your next! And Stevie is – wow! Such a wonderful voice & style, and so much emotion! Perfection! Huge thanks again to you and Rita for introducing me to the magic of her audio-books! I have read and loved all of Joana’s books and posted reviews. I have listened to audio books while on long trips, even listening to a children’s book to keep my children from saying, “Are we there yet?” while traveling to Niagara Falls in Canada. Even my husband commented on enjoying the book I chose that time. I rarely listen to audio now that I am retired as I have also given up long distance driving. When we travel to visit grandchildren my husband usually as a sports event or talk show on. But I am sure if I won a chance here I would chose the audio as your endorsement of the voices by this reader make me curious to hear her. Thanks for the chance. Thanks ever so much, Sheila, for all the wonderful reviews and the support you’ve so kindly given me and my books! Oh, the ‘Are we there yet?’ phase 😀 Sadly I haven’t thought about kiddies’ audio-books when we needed them most, so we had hours and hours of ‘The wheels on the bus go round and round….’ Still, it was fun to join in. Congratulations Joana! I know some friends who like audio books but personally I don’t focus as well hearing than I do reading – I’m very much a visual/action learner. Thanks for the giveaway! Thanks, Priscilla! I know what you mean, about the visual part & focusing. I tend to read fast to see what’s happening next, so the audio helps me slow down and take it all in. Best of luck and thanks for stopping by! Congratulations, Joana! I love audio books! Thanks for the giveaway. I would prefer to have one of her e-books because I haven’t got all of them yet but I do have The Falmouth Connection. Thanks, Pam, you’re so kind! Best of luck, I hope you win a copy and that you’ll love Stevie’s narration as much as I did. Oh, Joana! I’m thrilled to hear you are doing audiobooks! As you know, I adore your writing, your story-telling, well, everything your books, period! It’s the best news that you are now doing them in audio. I love listening when I draw so this gives me much to anticipate! I think Stevie is awesome too. This is quite a pairing! Congratulations on this new step forward! Oh, Stevie is truly awesome, isn’t she!! I’m over the moon to have them produced by her. Oh, Jami!!!! Thanks SO much for this lovely message and your wonderful support ❤ . I do hope you’re one of the winners. All the best and roll on September! Yay! A chance to win the giveaway for The Falmouth Connection audio book is amazing for me. Let me count the ways. 1. The Falmouth Connection has been at the top of my to-read list for a while, because I read the synopsis and interview here on this blog and knew then that it had that hint of Gothic (they’re in Cornwall, so clIffs and coves and the sea) that I so love, and to have that injected into P&P sounds delicious. 2. As some of you know, I can’t read ebooks because of my head and neck issues, so I prefer hard copies or audio books. And since I’m laid up in the hospital at present, I would love (LOVE) to raise my spirits by getting lost on the journey with Darcy and Elizabeth. 3. I’ll finally be able to to click “read” instead of “wish to read” on Goodreads. 4. It’s a book by Joanna Starnes. 5. Also I think the name of the book sounds classic and intriguing. You can tell a lot about a book from its title and the cover, abd on both counts it’s a win. Really, really hoping to win The Falmouth Connection audio book. Fingers crossed. All the best and get well soon. Hugs. I already purchased the audiobook of The Falmouth Connection. It is next on my to be listened to list. I enjoy Stevie Zimmerman’s narrations. She makes you feel as if you are a fly on the wall listening to the scene. And The Falmouth Connection is now if my favorites. I also thought I would never like audio books but when my commute became 3x it’s original length I had become frustrated with the wasted reading time so I delves into audio books and love them when doing housework and gardening as well. So glad your books are being turned into audio books. Looking forward to the next released. I would love an ebook! I have never read the Subsequent Proposal. Would love a copy of that!! Thanks for stopping by, Leah! Good luck and I hope you’ll like The Subsequent Proposal if you win. Thanks and best wishes, Denise! What synchronicity! I *just* finished reading “The Falmouth Connection” today…reading on my breaks at work. Hated that I had to stop in the middle of the final boat scene and get back to work! But I finished it as soon as I got home. What a lovely, lovely read. I loved how in the beginning they each saw the same incidences in completely different ways! Lovely. Darcy…utterly swoonworthy! I would be willing to try an audiobook if I win! What great timing! SO happy you liked it so much, missjamieann!! Oh, the early scenes, they were such fun to write. Poor, clueless Darcy, so full of himself 😀 . Thanks for stopping by to leave this wonderful comment and best of luck in the giveaway. If you liked the story, you’ll love Stevie’s narration! Take care and have a lovely weekend. Would love the chance to read this ebook. I’m a little weird about a strangers voice reading a story. But I wish you all the best with it! Many thanks for stopping by and for the lovely wishes, Charlotte! Good luck in the giveaway! Many thanks for stopping by and the lovely wishes, Charlotte! Good luck in the giveaway! Rita – many congratulations on getting Joana to venture into audio publishing. Joana – well done on taking the plunge into a new format. You’ll always have a ready listener in me. Many’s the time I’ve been listening to one of my JAFF audios on the way to work and haven’t wanted to get out of the car when I got there. It even happens when I get back home, sometimes (yes really, even after a long, hard day), especially if I’ve reached a crucial stage in the plot. My history with audiobooks goes back a long way; back to the days of the cassette tape – remember those? We bought the first four Harry Potter books, narrated by Stephen Fry, for our son when he was a child. Like Sheila, we found that they were great for long car journeys and preventing the “Are we there yet?” question coming up too often. But cassette tapes break or get chewed by the tape machine eventually and the CD versions were really expensive, so it wasn’t until some years later, when I discovered Audible, that my real love affair with audiobooks blossomed. Firstly, it was all of my favourite sci-fi novels and the Sharpe series and then I stumbled upon Pamela Aidan’s Fitzwilliam Darcy: Gentleman trilogy. Now, the majority of my audio library consists of Austen/JAFF/N&S and I have all of Abigail Reynolds’, Maria Grace’s, Pam Dixon’s, Joy King’s, Jennifer Joy’s and Nicole’s books that are available in that format, plus of course all of Jane Austen’s own works – Juliet Stevenson does those particularly well. I’ve long been wishing that your books were available there too, Joana. Stevie Zimmerman is in my top three favourite historical fiction narrators (along with Pearl Hewitt and Elizabeth Klett) and she does male voices particularly well (John Thornton, Darcy) without sounding weird, which must be a challenge for a female narrator. To hear that you’ve teamed up with her to produce The Falmouth Connection is just fantastic news! It still remains one of my favourites, up there with The Unthinkable Triangle and Mr. Bennet’s Dutiful Daughter. I already have all of your books in ebook or paperback, or both, so to have a chance to win an audio of one of them is lovely, thank you. Anji, here is the states you can rent audio books from the library, both children’s and adults and you can make suggestions/requests for which books the library should buy. That is how I used to have audio cassettes for our trips. Maybe, I’ll bet they do, libraries in GB have the same. Hi Sheila. I know we can rent audiobooks on CD from the library over here, for a fee, and I have done in the past, but the state of them is sometimes quite appalling. I once rented Harry Potter and the Deathly Hallows for a long car journey and one of the discs was so badly scratched that we couldn’t listen to it at all and the others in that set had sustained some damage, too. At least the library refunded me some of my rental fee, but not all of it! That’s why I now prefer my Audible subscription. I believe it’s possible to rent digital downloads now but I haven’t explore that avenue yet. Wow, Anji!!!!!! Thanks SO much for the wonderful message and all your support, you’re amazing! I know the feeling, not wanting to get out of the car when I get there, or when I get home 😀 . And so happy to hear you’re a Sharpe addict too!! We really have to find a way to meet and chat, by the sound of it we could go on for days. 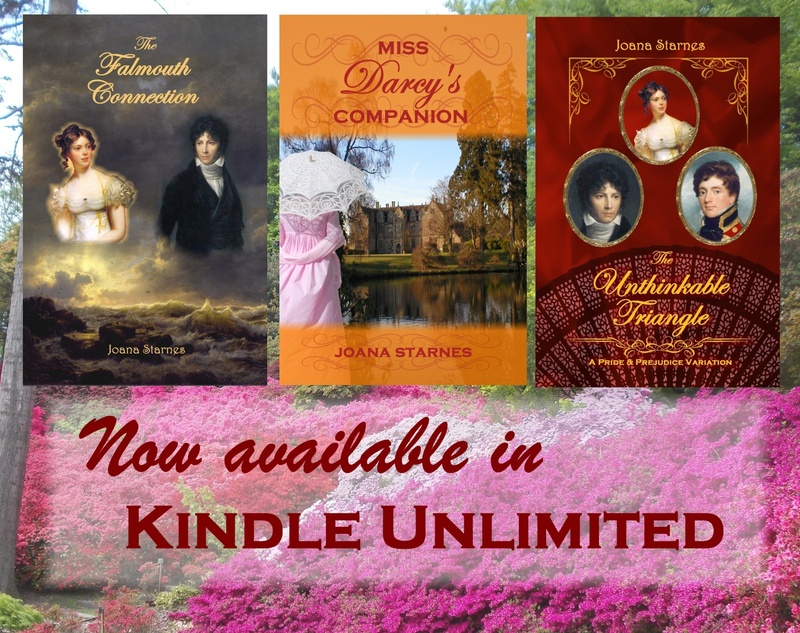 I’m so happy that Stevie is producing the audio-books, her Darcy & Thornton are out of this world, and SO glad that The Falmouth Connection, The Unthinkable Triangle & Dutiful Daughter are among your favourites. I hope you win a copy, Stevie’s narration is simply magical. All the best and have a lovely weekend. I have read and truly loved all of your books. I am trying to resume my daily walking and listen to audio books on my iphone. I would love, love to win a copy of The Falmouth Connection. I will feel like Elizabeth on her rambles as my feet hit the asphalt. Walking relieves stress for me. Thank you for this wonderful giveaway. Thanks ever so much for the kind words about my books, it makes me so happy to hear you loved them! I hope you win, it would be wonderful to think that ‘Falmouth’ is keeping you company in your rambles and making you feel like Elizabeth Bennet. Audiobooks sound great for if you’re on the road. But I think that I wil miss actually reading a book myself, instead of listening to one. Therefor I’d love to be included for the ebook, thank you! Thanks for stopping by to read the port, Jo’s Daughter, and good luck in the giveaway! Thanks, Jen, and all the very best to you too!! So wonderful to hear you have all the ebooks, Audrey! I hope you’ll have some of the audio-books too. Many thanks and best of luck! Isn’t it heartwarming to see what springs forth from a little encouragement from a dear and trusted friend?? Amazing that we can now sit back and relax and let the dulcet tones of Stevie’s voice transform us into another world,inhabited by those characters we hold dear!!! Heartiest congrats,Joana,on this,your first audiobook! I know it will be just as well received as your paper/kindle versions,and may very well lead to legions of fans clamouring for more of the same,from both you and Stevie! I’ve read all Joana’s books,except for From This Day Forward,which,for some strange reason,has slipped through my reading net! (Note to self-this must be remedied in the very near future!). Needless to say I’ve loved each and every one and have posted my meandering thoughts on GR!! Thanks ever so much, Mary, for the kind words, the wonderful support and the fabulous reviews! Congratulations! What wonderful news. I have finally found the value of audio books and am thrilled your books will be available. I have read most of your books so would love a chance to win either the audiobook or the ebook. Thanks for stopping by and for the lovely message, Becky! I hope you win and that you fall in love with Stevie’s narrations too. All the best! Congrats. I’ve just started listening to audiobooks and really enjoy hearing some of my favorite stories come to life. Thanks! I’m so glad to hear that! Best wishes and good luck in the giveaway! It’s so interesting to hear how you moved over to audio, Joana. And I’m so glad you did, because in recent times I have embraced audio reads too! I never thought I’d be able to manage them because I am quite distactable so reading a paper or ebook is good because it keeps my hands and eyes occupied! For this reason I never thought I’d manage an audio read. Anji’s praise for audio in conjunction with a lack of reading time encouraged me to try them, and now I have audio books in the car on my commute, with headphones if I go for a walk at lunchtime, and when doing chores at home. I am converted, and in fact, I have read more in audio than in text this year. The only thing I struggle with is the confidence to listen to a new book in audio rather than a reread, as I am not giving my full concentration to the book. I am looking forward to revisiting Falmouth, and listening to Stevie’s narration, because I have heard such high praise of her work. Please don’t enter me for the lovely giveaway, Rita because I am a lucky person who already has all the prizes! I’ve only recently discovered the joy of audiobooks too, Ceri, and wish I discovered it sooner! Reading with your ears – such a perfect turn of phrase! I’ve learned it yesterday from Claudine and loved it. All those times when we can’t read the old-fashioned way – audiobooks are the perfect answer and it’s great! I end up wishing long journeys were even longer, all those jobs around the house might actually get done and exercise becomes a treat rather than a chore. So glad you’ve become such a fan of reading with your ears and I hope you’ll love Stevie’s style as much as I do. Have a really good week and thanks for this lovely message and all your support! Joana, congratulations on the release of your first audiobook. 🙂 And with Stevie, no less. Rita, big hugs for bringing Joana on board, I was hoping she would do that. Thanks, Kate!! I’m ever so grateful to those awesome ladies and so lucky to know them! Rita, Nicole, Elizabeth and Stevie, THANK YOU, you rock!! Good luck, Kate, I hope you win and have fun with the virtual trip to Cornwall. Take care and all the best! How exciting! I’m not one to choose audio over print but you might just change my mind. Still, I think I’d prefer an Ebook since I still haven’t read Mr. Bennet’s Dutiful Daughter or Miss Darcy’s Companion and they’ve been on my list for ages. Thanks for the giveaway and congrats on your new venture.